Talk about being late to the party. 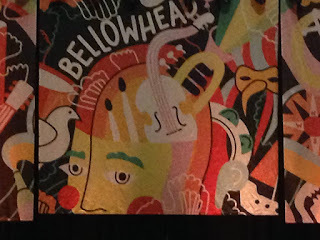 Twelve years after Bellowhead got together I finally saw them live, on nearly the last gig of their final ever tour. What was even worse I loved it. 9. How the audience were encouraged to raise their arms up and down with very little resistance. 10. How it's possible to make playing the cello look jaunty. There are probably many more questions but I was so blown away I forgot the rest, along with the word for tambourine. I'm not really sure why I'm writing this. A review of something you will never see (unless you have a ticket for the rest of the tour) isn't overly helpful I guess. Hopefully it might encourage you to look up all eleven players individually and go and see what they are up to next. Or buy Bellowhead albums if you don't have them already. But my Mum is right, nothing is like seeing Bellowhead live. Sorry.